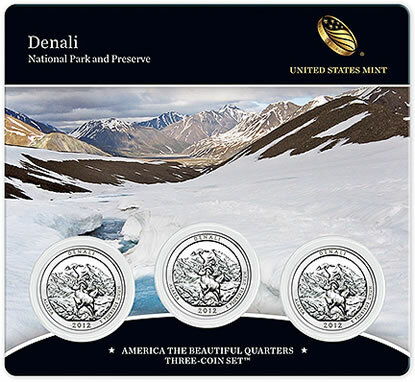 Starting demand for the 2012 Denali National Park Quarters Three-Coin Set dipped compared to past sets. Its debut sales logged in at the slowest pace since the 2011 Chickasaw quarters set. Between its release on Tuesday, December 4, 2012 and Monday, December 10, 2012, U.S. Mint sales figures show orders totaled 10,509. That is the second weakest start in the quarters three-coin set series since introduced in 2010. One of a few U.S. Mint multi-year products dedicated to one coin program and the only one where collectors can backtrack to place orders for any released, the following table shows starting and current sales for every three-coin set issued. Three-coin sets contain three collectible America the Beautiful Quarters of the national park or national site they honor. Denali sets have a 2012-S proof quarter, a 2012-P uncirculated quarter and a 2012-S uncirculated quarter that are held in an attractive durable plastic card featuring an image of Denali National Park in Alaska. Sets are available online through the U.S. Mint website at http://www.usmint.gov/catalog.